MicroTonic has been updated and redesigned. Sonic Charge certainly knows how to produce high-quality plug-ins, but it doesn't release that many of them. We were pleasantly surprised, therefore, to discover that not only has it updated the excellent MicroTonic drum machine, but it's also released a completely new vocal processing effect in the shape of Bitspeek. 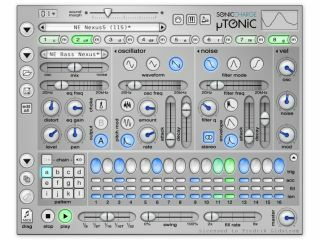 MicroTonic (pictured above right) is a drum machine that produces synthetic sounds, and version 3 is the first major update to it in five years. More than 20 new features have been added (check out the full list here) and the interface has been redesigned. It's priced at $99 (+VAT) though registered users can get the update for free. Bitspeek, meanwhile, promises to "recreate any audio you feed into it using pulse oscillators, white noise and linear prediction filters". You can find out more at the Sonic Charge website, where Bitspeek can also be purchased for $29 (+VAT). Both plug-ins are PC and Mac compatible and come in VST/AU formats.